The finalists for the first annual Aspen Words Literary Prize have been announced. The $35,000 award will be given for a book of fiction published in the previous year that “illuminates a vital contemporary issue and demonstrates the transformative power of literature on thought and culture.” The winner will also receive an all-expenses-paid trip to attend the 2018 Aspen Words Summer Benefit in Aspen, Colorado, as a featured speaker and guest of honor. 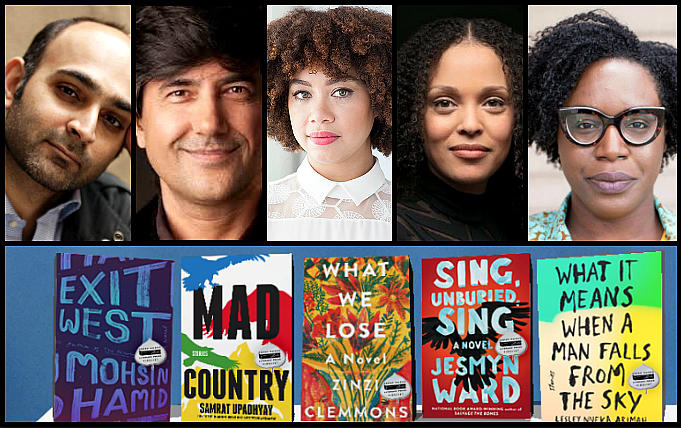 The finalists are What It Means When a Man Falls from the Sky  (Riverhead Books) by Lesley Nneka Arimah, What We Lose  (Viking) by Zinzi Clemmons , Exit West  (Riverhead Books) by Mohsin Hamid, Mad Country  (Soho Press) by Samrat Upadhyay , and Sing, Unburied, Sing  (Scribner) by Jesmyn Ward . Judges Stephen L. Carter, Jessica Fullerton, Phil Klay, Alondra Nelson, and Akhil Sharma selected the finalists from twenty semi-finalists. The winner will be announced on April 10 at an awards ceremony  at the Morgan Library in New York City. Visit the Aspen Words website  for more information.